However it is vital the industry builds confidence and maintains livestock numbers, McLaren said speaking at the QMS Industry Breakfast on the opening day of the Royal Highland Show. 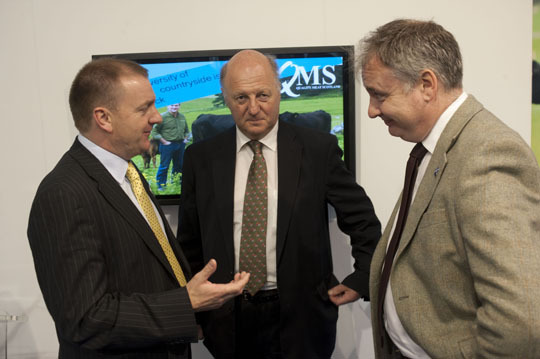 Pictured on the opening day of Royal Highland Show at the QMS industry breakfast are from left Jim McLaren, chairman of Quality Meat Scotland, UK Agriculture Minister Jim Paice and Richard Lochhead, Rural Affairs Cabinet Secretary. “From the world-leading quality assurance behind our labels to our high animal health and welfare and our natural, grass-based cattle and sheep production systems, our industry has a fantastic story to tell in terms of what sets our brands apart. “I have absolute confidence that for the Scottish red meat industry the future is bright,” he said. In January this year Scotch Beef was named the biggest selling Scottish food and drink brand in Great Britain, according to Kantar Worldpanel, with sales totalling more than £247 million. “The latest grocery share figures from Kantar published this week show a dramatic jump in the run-up to the Diamond Jubilee, with an extra £213 million worth of general grocery sales in the tills that week,” observed McLaren. This week also saw QMS launch the Scottish Red Meat Industry Profile 2012 which reveals the industry contributed a record £2.1 billion to Scotland’s economy last year. “However, this piece of work by our Economics Services team also brings sharply into focus the knife-edge margins being endured by many in the processing sector. “Maintaining critical levels of raw material is crucial and it is vital we maintain the livestock numbers needed to satisfy the demand for our world-acclaimed brands. A demand that is set to grow year on year,” said Mr McLaren. Two key policy drivers which will, he said, have an impact on the volume of product, or critical mass of our industry in the future are the outcomes of the CAP reform process and the Woodland Expansion Proposals. On the latter, he said QMS welcomes the work of the Woodland Expansion Advisory Group, which the Cabinet Secretary set up to look at the whole issue of tree planting. “We await its findings with interest,” said Mr McLaren. “On CAP it is becoming ever clearer that budgets will become the key issue. From the point of view of Scotland’s livestock industry, we must have a system flexible enough to target support at active livestock producers and principally at those who are breeding,” he added.